A QEII reserve of 14 acres of virgin native bush including upwards of 250 very large forest trees. Some of these trees are giants like the Kahikatea with girth more than 8 metres. There are 3 tracks, all level, all different, totalling 1 km and 2 hours. Tree labelling is continuing and track surface is good but continually being upgraded. 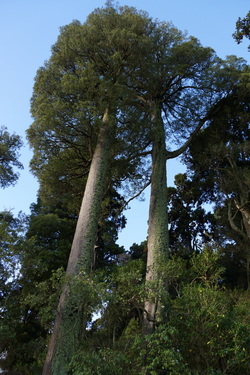 The bush is home to huge Black Maire and Kahikatea. But there is a great variety of both tree species and bird life. Located at Pemberton Farm on the corner of Rangiwahia Rd and Mangamako Rd, tours may be arranged by contacting owners Bob and Prue Wakelin, who are also building a bird corridor access to Bob's Bush.